At its roots a VA Loan is a loan that is from the Department of Veteran Affairs and is probably one of, if not the best residential mortgage loan program in existence where the mortgage rates are low, mortgage insurance is not required, and no down payment is required. If you do not have a Certificate of Eligibility from the Department of Veterans Affairs, then you cannot get a VA Loan, let alone a VA Streamline Refinance. If you currently have a VA Loan, you can definitely qualify for a VA Streamline Refinance and on this program, there is no appraisal required, no credit scores required, and no income verification needed either. If you currently have a high interest rate on your VA Loan, then a VA Streamline Refinance can help you in savings thousands of dollars over the course of the loan by refinancing to a lower interest rate. Since there is no credit score requirements for a VA Streamline, you are allowed to have late payments on any debt except for your mortgage and you can still qualify for a refinance. The one thing that is required is that you have been current in the last 12 months on your VA Loan, but one 30-day late payment can be had on your VA Loan, but it has to be due to extenuating circumstances. If you are looking to do a cash out refinance with a VA Loan, you are able to do so as long as you have your Certificate of Eligibility from the Department of Veterans Administration. With this, you can cash out up to 100% loan to value and you can refinance out of Conventional or FHA Loans as well. A cash-out VA Loan is not the same as a VA Streamline Refinance. 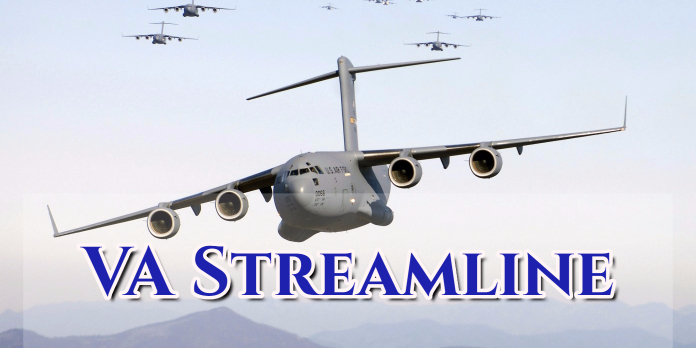 A VA Streamline is only a rate term refinance and not available for cash out purposes. If you already have a VA Loan and are looking to reduce your interest rate via the VA Streamline Refinance, then you need to call me today at 888-900-1020 and we can help save you thousands over the course of the loan.